A computer rendering of the proposed Nordic Aquafarms site in Belfast. 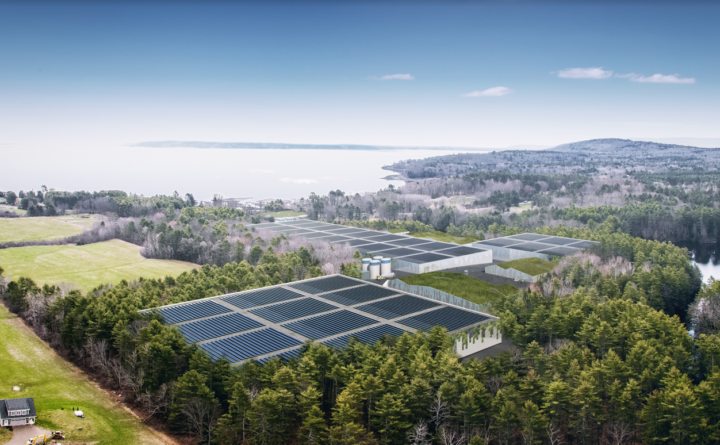 The Maine Department of Environmental Protection is asking the Norwegian-owned company that wants to build one of the world’s largest land-based salmon farms in Belfast for more information as it considers its waste discharge permit application. Last week the department asked Nordic Aquafarms Inc. to submit more information to show exactly where the proposed salmon farm’s outfall pipe will be placed. The department also asked for information that will prove that the company has the “title, right or interest” to build it there. A few days after Maine environmental regulators sent a letter asking for the new information, an attorney for Nordic Aquafarms wrote a letter to Melanie Loyzim, the acting commissioner of the Maine DEP, to request something else: that the state’s Board of Environmental Protection take jurisdiction over the project’s waste discharge permit application. The Board of Environmental Protection is made up of citizens nominated by the governor. That is something that Kim Ervin Tucker, the attorney representing Upstream Watch and the Maine Lobstering Union, has been asking for, but on Wednesday she said she was surprised that Nordic Aquafarms had offered it independently. She is one of the people fighting against the salmon farm, which opponents believe could pollute Penobscot Bay, among other concerns. The Board of Environmental Protection only assumes jurisdiction over projects that are of statewide significance and that meet three of four criteria: that it will have an environmental or economic impact in more than one municipality, territory or county; that it involves an activity not previously permitted or licensed in the state; that it is likely to come under significant public scrutiny; and that it is located in more than one municipality, territory or county. In December, Loyzim found that the project was located solely in Belfast, not also in Northport, which some opponents have claimed. It also involves an activity that has previously been permitted in Maine, and so didn’t meet the criteria. But Maine DEP officials decided to re-evaluate her decision. Brian Kavanah, acting co-director of the Bureau of Water Quality, said that the agency had received comments provided primarily by Tucker that gave officials pause. What’s in question is whether the outfall pipe will cross the intertidal zone only in Belfast or in Northport, too. He said that the department will consider Nordic’s request to have the Board of Environmental Protection take jurisdiction over the permitting process but has not made a decision yet. “It certainly is evolving as we move forward,” he said of the fish farm’s application process. Marianne Naess, Nordic Aquafarms’ director of operations, said she and other officials are still looking forward to moving through the licensing process. If the Board of Environmental Protection assumes jurisdiction, it will mean that three license applications can be merged — the Maine Pollutant Discharge Elimination System, or waste discharge, permit; the Site Location of Development Act permit; and the Natural Resources Protection Act permit. She said that the company decided on its own to ask for the Board of Environmental Protection to head up the process.